This is about my 2nd and 3rd day touring around Wiesbaden. 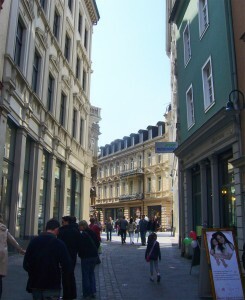 Wiesbaden is widely renowned as a “leafy city”. Its numerous parks and gardens, the Taunus hills and the Rheingau region right on its doorstep attract many visitors who like to spend time in natural surroundings. Popular spots are the spa gardens, which have a concert stage, and the Warmer Damm municipal park. 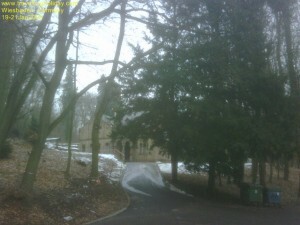 The Nero valley park leads down from the lower station of the historical Neroberg railway. Biebrich Palace has extensive baroque grounds. I believe you would need somr sort of wheels ( train/bus/car) to visit some these places and fortunately our gracious host, drove us to see these fantastic sights. When I was tehre, it was winter and the moutain train were not running but I was told that it is an engineering wonder using just water power to operate this cable car. This cable car installed in 1888 is driven only by water ballat and is considered to be a monument to technical culture. The route up the mountain is 438.5metre long and takes a 25% climb in its stride, the difference in altitude being 83m. That sound very scientific to me! (you can tell I don’t really understand this jargon). This church with five golden cupolas was built between 1847 and1855 as a sepulchre for the mortal remains of the wife of Duke Adolf, Grand Duchess Elizabeth Michailovna anbd her baby. 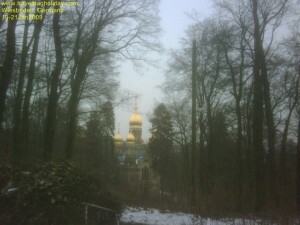 The Russian Cemetry was laid out in 1856. The famous painter Alexej Jawlensky is also burried here. This church is worth visiting. A magnificent sight in winter. 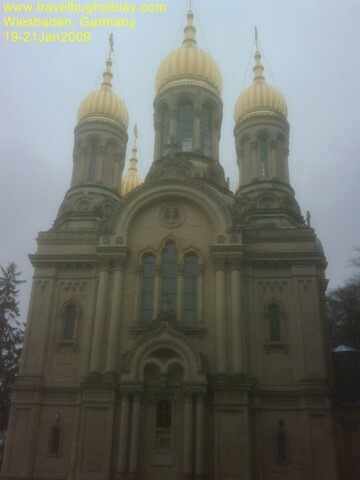 Even if you don’t go inside the church, the grounds are facinating and the view up there is awesome. Eventhough it is a short walking trip to Neroberg Hill, my host drove us there. It feels more than 20 minutes walk (as was informed by the internet). Maybe our host took us on the scenic route. 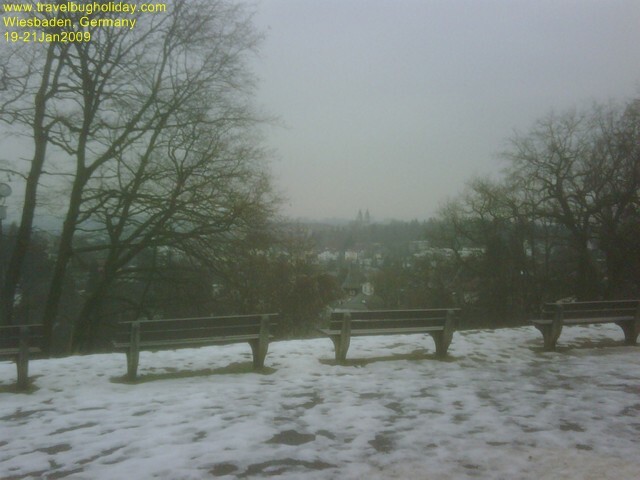 Virtually the whole of Wiesbaden can be seen from Neroberg hill, which is a good starting point for longer walks. Its beautiful lawns are ideal for a picnic and it is a wonderful place to escape from everyday life. Wiesbaden provides plenty of opportunities for leisure and recreation in natural surroundings. In winter, the view from this hill is a whole lot different as I had seen photos/imagined on the internet. 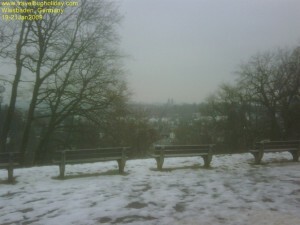 Neroberg hill in Wiesbaden is an ideal starting point for walks through the town fores t and is itself an extensive recreation area. With around 50 animal species and many rare plants, Fasanerie Zoo and Gardens is a popular day out for families. Tours of the Upper Middle Rhine Valley, a UNESCO World Heritage site, leave daily from the Wiesbaden-Biebrich jetty. Apparently every year in summer there is an improvisatio n theatre festival taking place directly on the Neroberg, I can definitely recommend this. Great shows, atmosphere, and – the entrance is basically free, you just pay as much as you think it is worth. 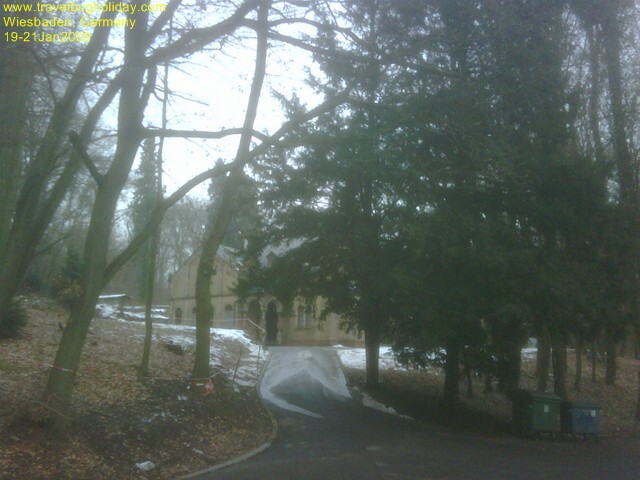 Neroberg is a hill close to the city centre. You need just about 20 minutes walk to reach it. You can take a cable car (Nerobergbahn). 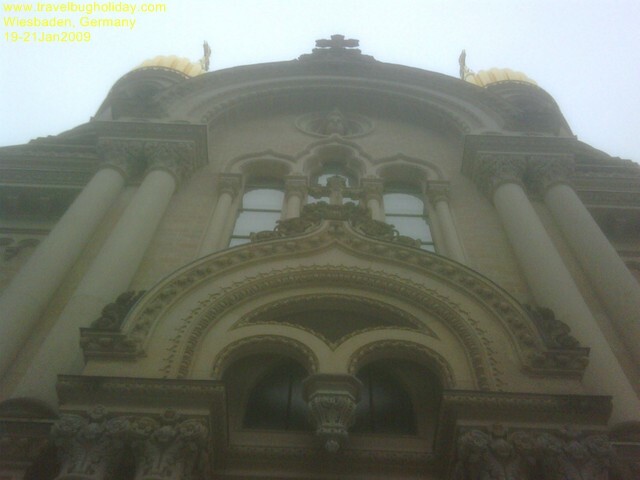 On the top th ere is a small restaurant, the Russian Orthodox Church (previously mentioned) and if you take your sport shoes there is a special attraction – a rope park! 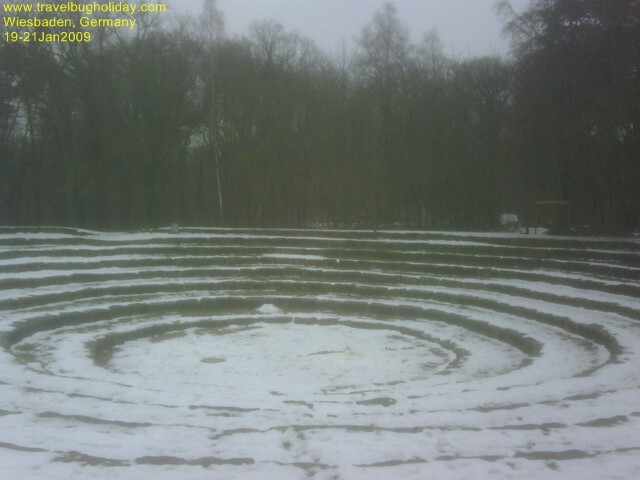 In winter, it was too cold and wet and nobody was there when I went! The spa gardens to the rear of the spa assembly rooms were laid out in the style of an English landscape garden and are dotted with magnolias, azaleas, rhododendrons and cypress trees. There is a fountain on an artificial island in the pond and a highly ornate, shell-shaped bandstand. The remains of the columns from the old spa assembly rooms and a bust of Dostoyevsky can be seen in Nice Square. Biebrich Palace Park is both a historic garden and a public park. Formerly a baroque garden, it was redesigned in the English landscape garden style by the horticultural architect Friedrich Ludwig von Sckell and still has great artistic merit today. 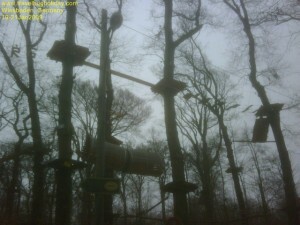 It is now used as a recreation area as well as a pleasant place for an outing. 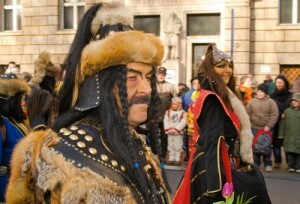 As a regional capital Wiesbaden enjoys a diverse cultural scene. 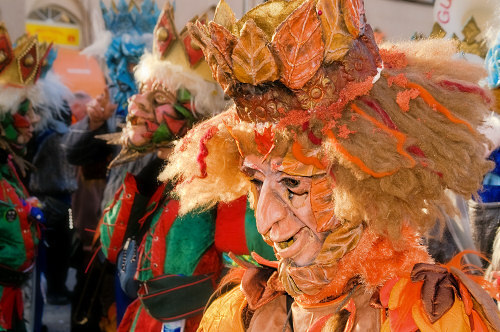 From the European Circus Festival o the Wiesbaden School of Music and Art, iesbaden covers every aspect of vibrant, innovative cutting-edge culture. I only managed to vist the Hessian State Theatre and the Laughter Museum. Near to the Casino is the Hessian State Theatre. Opera, drama and ballet productions together with a wide range of repertory shows are part of the theatre’s comprehensive cultural offering that also includes classical works as well as modern music theatre. Because all three of the Hessian State Theatre’s stages can be used simultaneously, it is not unusual for four performances to take place on one day. Built on behalf of Emporor William II in 1894, the magnificent and majestic foyr in Roco style was added in 1902. Its grand hall was designed in the Nero-Baroque style. 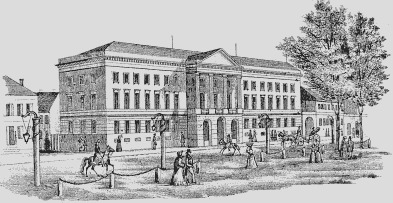 The theatre colonade (1839) forms together with the Kurhaus a horseshoe-shaped complex encompassing the so called Bowling Green. Wiesbaden’s Harlekinäum is a ‘Museum of Laughter’, featuring oddball exhibits from all over the world. It’s an ideal day out for anyone who fancies having their funny bone tickled. Explore the world of comedy and the surreal across eight fun-packed rooms. You can even take a guided tour with a difference, courtesy of the museum’s “clown doctors”. And it’s the only place we know of where you have to pay for a ticket to get out! Open every Sunday from 11.11am to 17.17pm (!) from April to the end of August. 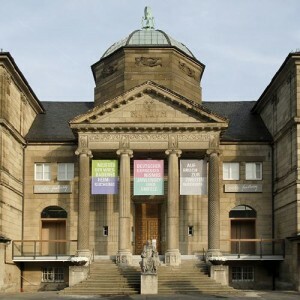 Wiesbaden’s Women’s Museum – an internationally renowned institution – was founded in 1984 with the aim of depicting the achievements of women in history, society and culture in order to highlight values that women and girls can identify with. 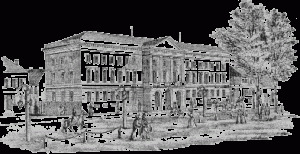 The permanent exhibition is entitled “FrauenStadtGeschichte (n)” (WomenCityHistorie(s)) and focuses on the lives of various women, each of whom left their own particular mark on Wiesbaden during their lifetimes. It honours feminine aspects and names from history that, because of unspoken patriarchal laws, have long been forgotten. The museum also hosts temporary exhibition by artists from around the world as well as a number of events. Open on Wednesday, Thursday and Sunday, guided tours on request. Wiesbaden Museum has attracted international attention with its outstanding collection of expressionist paintings, natural history collection and exhibition of medieval and Roman artefacts. The museum possesses 90 works of artist Alexej von Jawlensky (1864-1941), who lived in Wiesbaden from 1921 until his death. Its natural history collection focuses on the geology of Europe, as well as the habitats found in tropical rainforests, savannahs, deserts and the Arctic. An exhibition of local artefacts from Roman times and the earl y Middle Ages form the basis of the Nassau collection. Closed on Mondays (except public holidays), 1 January, 1 May, 24, 25 and 25 December. Guided tours available. With an exhibition area of 800m², the Regional Natural History Collection in Wiesbaden is one of the largest of its kind in Germany. Featuring exhibits from the world of zoology, botany, geology, mineralogy, palaeontology and ethnography, the collections have been looked after and developed by museum staff since 1829. One of the museum’s true gems is the insect collection of Johann Christian Gerning, in particular the butterflies. Guided tours available. Opened in 1993, the interactive museum at Freudenberg Mansion in Wiesbaden takes visitors on a fascinating journey of discovery to explore the senses at more than 50 different experimental stations. Visitors learn to appreciate new impressions by trying out a variety of activities relating to hearing, vision and movement. Inside the mansion , visitors experience sounds, tones, aromas, darkness, light and much more from a completely different perspective and with a new, holistic feeling. A barefoot trail gives feet that are used to weari ng shoes the opportunity to experience a completely new set of sensations. 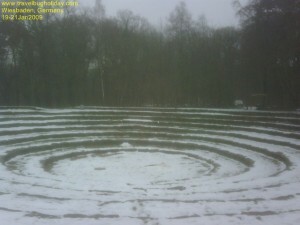 Visitors can also follow a stony labyrinth, explore vibrations, paint with sound and much more besides. Closed on Mondays and a t Christmas/New Year, guided tours available. 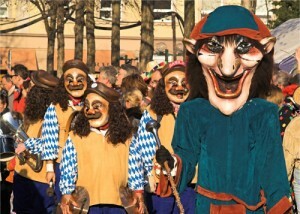 Wiesbaden’s festivals and markets contribute a lot to the quality of life for the locals and visitors. The range of different events here is extremely wide, with a festival to suit every visitor. It was a pity, I miss the Christma s market as I arrived in late January. I therefore researched on the internet to find out what I had missed. Quite a bit ! as I would have love to see the Christmas colours in all its winter glory in Wiesbaden. 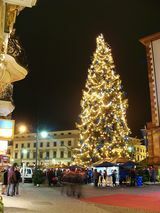 Lights in the shape of the lilies on Wiesbaden’s coat of arms, a magnificent, 30 metre high, decorated Christmas tree, festive aromas and Christmas music set the scene for the annual Sternschnuppenmarkt Christmas market. Lots of different things to buy, delicious seasonal food and plenty of entertainment put everyone in a festive mood. 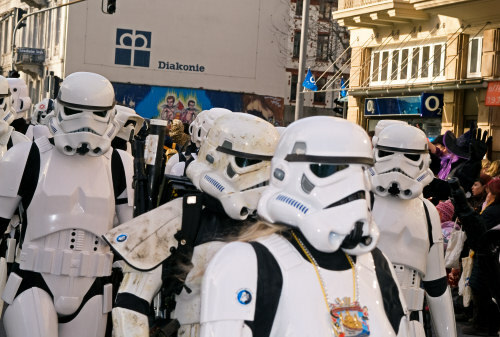 Every year, from June 3rd to June 5th, this classic street festival along Wiesbaden’s most distinguished boulevard, the Wilhelmstrasse, is still a crowd pleaser after more than 30 successful years. The Theatrium or Wilhelmstrasse street festival is one of Germany’s oldest street festivals, enticing people out onto the street every ye ar. Dance displays, cabaret, acrobats, arts and crafts, culinary treats and finally a firework display can be seen in Wilhelmstrasse, the grand boulevard running through Wiesbaden. Artistic and theatrical flair are to be seen and heard everywhere. A gathering of creative powers, a feast for the eyes and the ears, pleasure and the joys of life under the open sky! I would have loved to mingle with the crowds.